Bailey Records has some new token sets available for Kaiju Kaos. Available now on Wargame Vault. 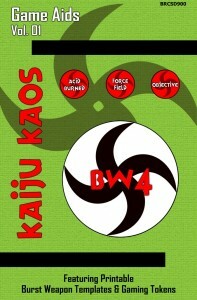 Featuring printable Burst Weapon Templates & Gaming Tokens for use with BRCSD901: Kaiju Kaos - The Miniatures Game (2011 Bailey Records). Wyrd has new "Easter Bunny Goblin"